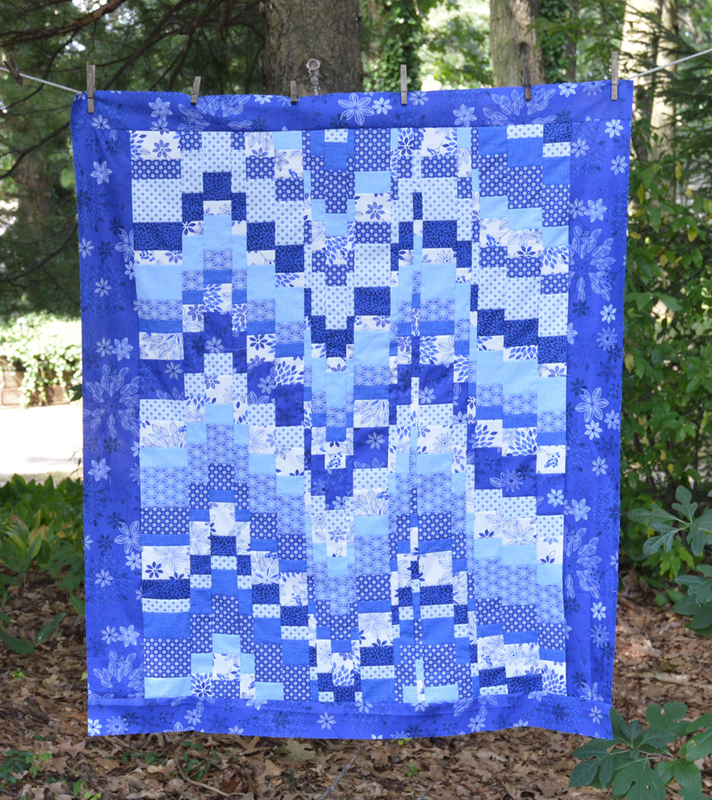 Today's tutorial features a bargello quilt--the perfect way to show off the gorgeous blues of the Fleur de Bleu fabrics! 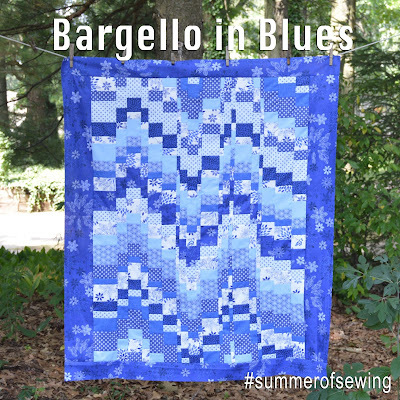 If you haven't made a bargello before, don't worry! We'll walk you through all the steps. It's easier than you think. Make sure to scroll down to the bottom of the post to find out how you can win a bundle of Fleur de Bleu fabrics. Quilt Size: 39-1/2" x 47-1/2"
Step 1: Lay out the strips in the order shown. 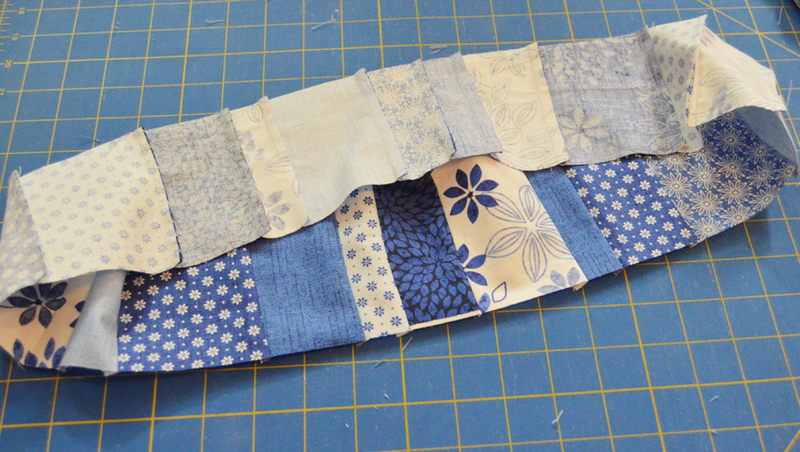 Step 2: Sew the strips together lengthwise into a large pieced strip. 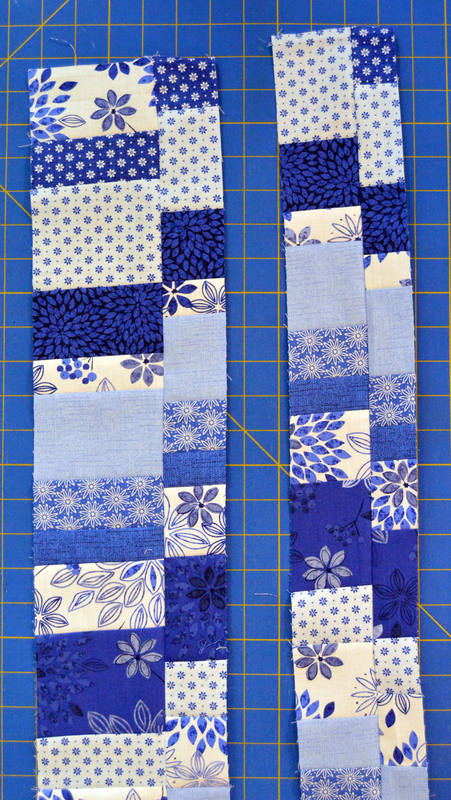 Hint: Sew strips together in pairs and continue joining pairs until strip set is complete. Note the numbers on the strips below. Use these numbers as reference in step 4. Step 3: Sew strip 22 lengthwise to strip 1 to turn the strip set into a loop. Step 4: Flatten the loop and trim one end to create a straight edge. Step 5: Referring to the chart (download it here), cut the indicated width strips from the loop. Step 6: Again referring to the chart, open the seam in each loop between the fabrics indicated in the second column. 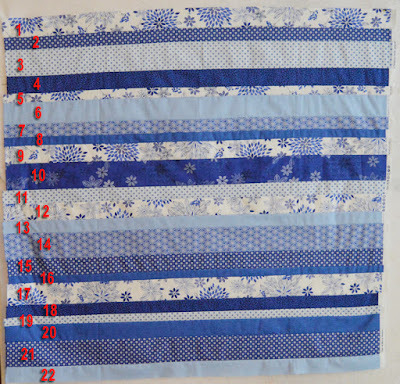 Label each pieced strip (column 3). 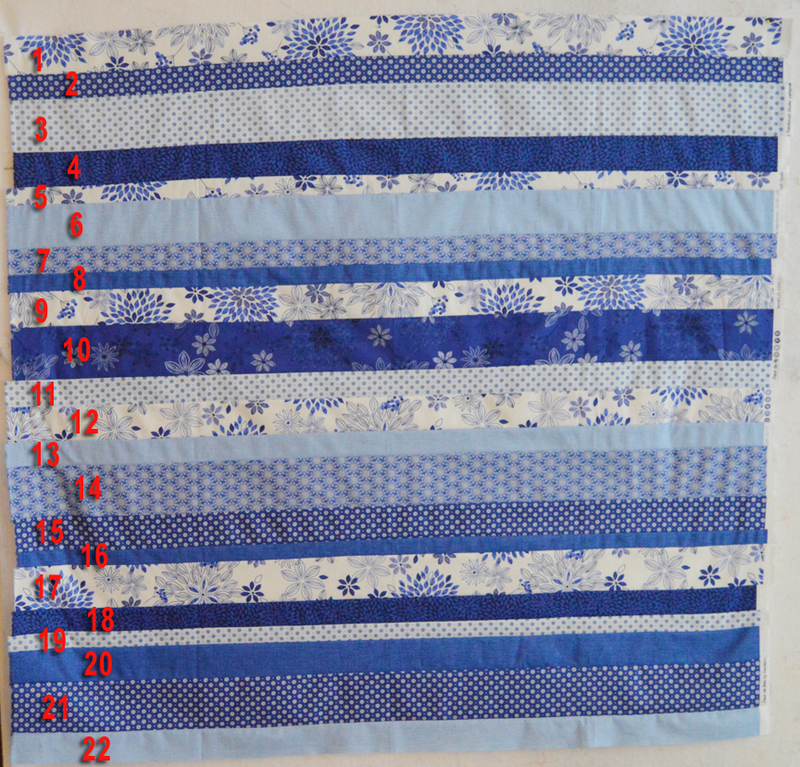 Step 7: Lay out the opened loops in numerical order and begin sewing them together in pairs. 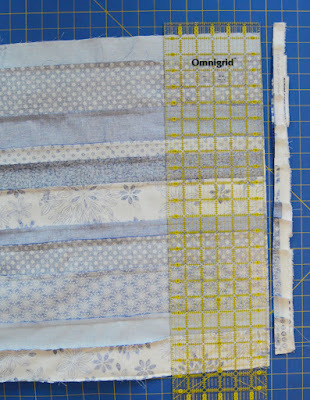 Tip: Find and mark the center of each pieced strip. Match centers and ends of the strips you're joining and pin to help minimize stretching that can occur because of the large number of seams. Step 8: Join the pairs together until the quilt center is assembled. 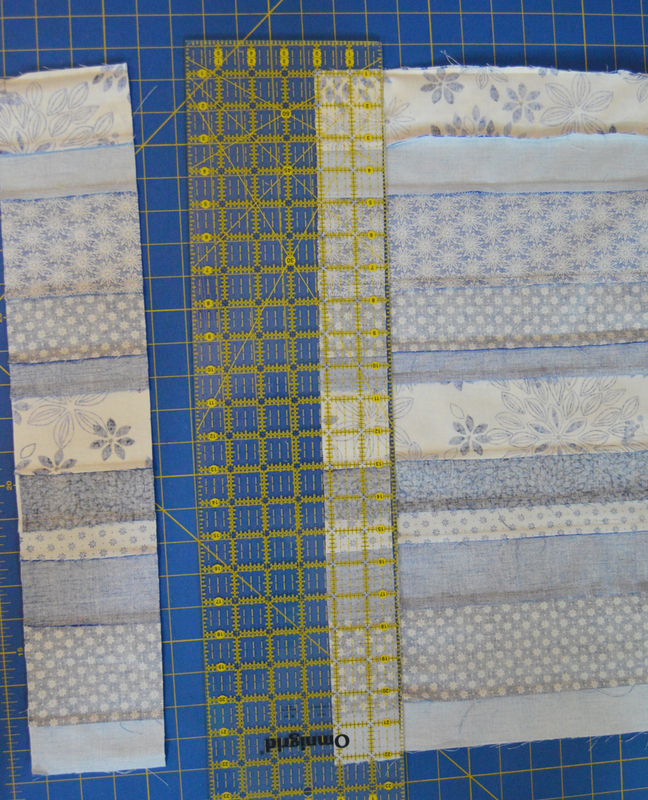 Step 9: Sew the 4-1/2" wide Fabric B strips to opposite sides of the quilt center. Trim excess. Sew the 3" wide Fabric B strips to the top and bottom. Trim excess. 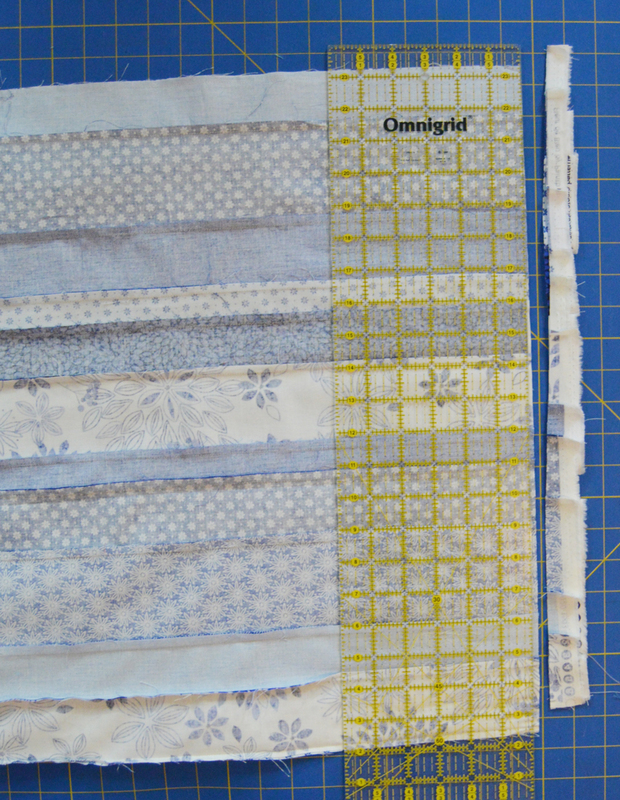 Step 10: Layer the backing, batting and quilt top and quilt as desired. 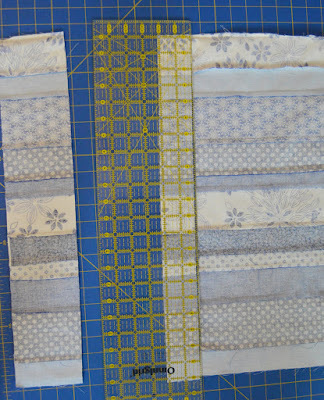 Use the (5) 2-1/4" x 42" Fabric E strips to bind the quilt. Love all the movement created by the bargello effect! Would you like to win a bundle of Fleur de Bleu fabrics? Leave a comment below (or on IG) telling us your color. Giveaway is open through Sunday, August 20th at 11:59 PM CDT. My color is also blue. I like blues and reds. I am stuck in a mire. Different colors appeal at different moments. Rose pink for calm cheery days. Blue for calm days. Yellow for playful days. Neutral for days when you need some comfort. So beautiful .I've never done a barguello quilt.Only runners and cushions.Thanks dor the tutorial and tips. Must I choose? Reds, I suppose. Or blues. Reds and blues. With golds as accents. And their gentler versions for quiet times--pinks, blues, yellows, reminding me of summery days of my youth. Love blues to teal colours. Love blues and teal. Great pattern. Thanks! My color is blue. Thank you so much for the tutorial and the chart I have always wanted to make a bargello quilt. I love blue all the time, but right now I am really liking coral. My favorite color is purple; but I have really been using teal and turquoise lately also. 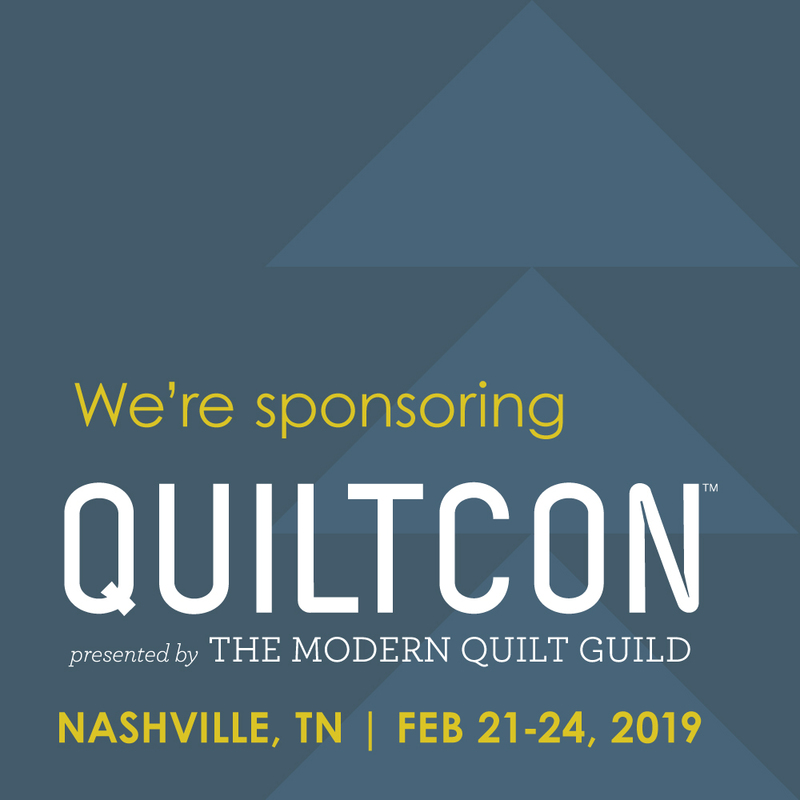 It has been quite awhile since I have made a Bargello quilt, but this quilt pattern sure has my name on it! Thank you for sharing and the opportunity to win a bundle of this beautiful fabric! Blue is usually my top choice and your quilt is gorgeous! I think this pattern would be so great in lots of other colors though. It looks like it will be fun to try out the pattern. Thanks! My favorite color is blue, all the way from teal to indigo into periwinkle and blue-violet. Blue eyes run in our family so my favorite color has always been blue. My grandson informed me his color is also blue. Blue - or fall colors like rusty reds. Thanks for the chance! Absolutely gorgeous blues and a really nice tutorial for the quilt! Gorgeous quilt. I love BLUE. Thanks for the giveaway! I have not done a bargello quilt but I might choose pinks for a new baby girl. Thanks for your tutorials and giveaways! I have one very large tub of blue, only blue. Guess I like blue?!?!? I love red, but have been buying lots of teal and turquoise. ROYBVIG are my colors lol. Really anything with bright colors. I love that the bargello quilt really isn't a "traditional" bargello. It looks like a pixilated bargello to me. Great quilt and fabric! I love blues! I also love purples. Thanks for the inspiration. I have two opposites--cobalt blue and fuschia! 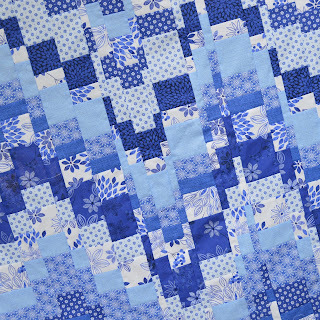 I love all blue fabrics - florals, stripes, geometrical, solids! I like blue--from baby to navy. Thanks for the great tutorial. Thank you for the tutorial. I have always wanted to try to make a bargello quilt. Blue is my color. Thanks! Your directions are clear. I now have to try to make one for myself in blues..maybe orange and yellow. thank you for posting the directions. Blue is my favorite! Love this quilt! i love all things blue especially blue/white and blue/yellow. What a great tutorial! 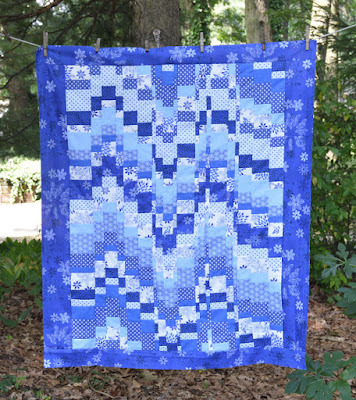 Bargello quilts look so difficult, but now I want to try this. Blue is definitely my color! Then purple and pink, but to me blue is the best. Anything except purple(yuck). Right now I have a lot of yellow in my stash. 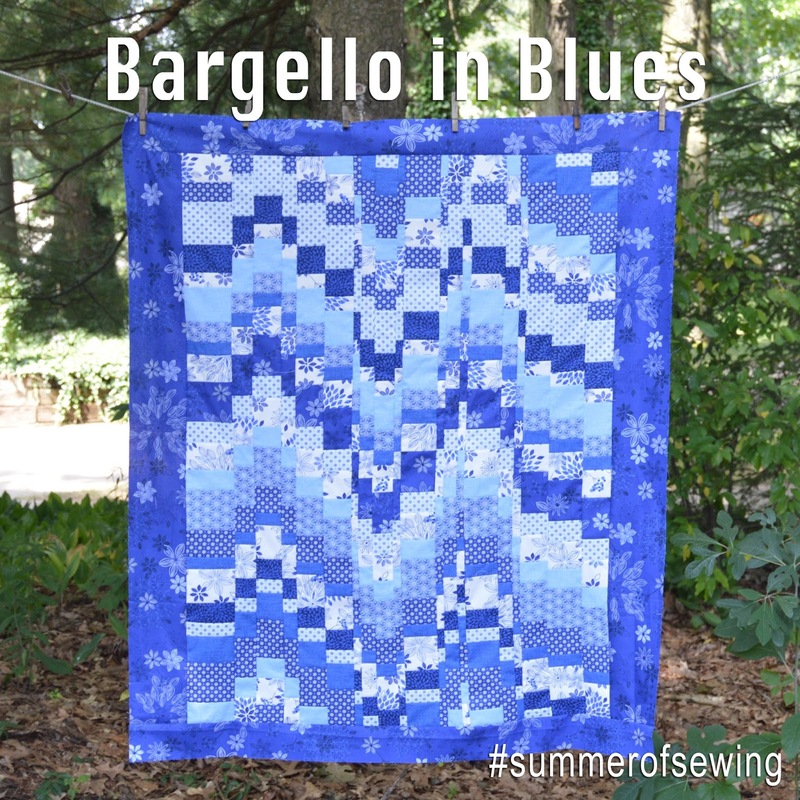 I've always wanted to try a bargello. Thanks for the well-written directions in the tutorial. The colors that appeal to me would be reds and a variety of whites. I'd say green is my favorite!